Mountain Climber is a Minifigures Series 11 minifigure set released in September 2013. The Mountain Climber has a yellow head with a smiling expression, along with distinct cheekbones and thin, protective goggles. His torso is red, though includes a black stripe at the top. A collar and zipper are printed upon the stripe, continuing down the torso, along with two strands of grey rope going across the minifigure's body that are stopped by two blue carabiners. A mountain-based Emergency insignia is placed in the top left corner, while a pocket is present in the bottom right. The arms are black, as opposed to the red torso, and have yellow hands. 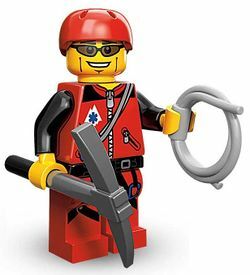 The minifigure's hips are black, unlike the red legs, but both possess printing of various buckles and mountain climbing ropes. Besides the figure, a red helmet, similar to Series 9's Roller Derby Girl, a dark grey pickaxe, and a new grey rope coil piece are included. In the Mountain Climber's description, the Yeti is mentioned, as well as a hint to Pretzel Girl, both of whom are Series 11 minifigures.